Sophomore cornerback Matthew Harris left Saturday’s game against Penn State with an apparent head injury. 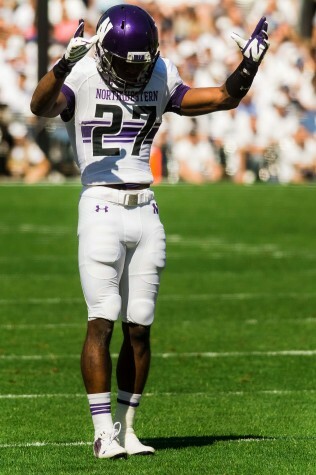 Coach Pat Fitzgerald said after the game all of Harris’ tests came back clear. At his weekly news conference Monday, Fitzgerald said he hopes Harris will be be able to play Saturday against Wisconsin. If fans expected Northwestern and coach Pat Fitzgerald to rest on their laurels after their best win of the season, they were mistaken. Fitzgerald used his weekly news conference Monday afternoon following Saturday’s 29-6 win at Penn State to run down the numerous areas for improvement the coaching staff saw during the conference-opening win. Junior cornerback Nick VanHoose expanded on Fitzgerald’s point, explaining how little details can impact the team’s performance. Fitzgerald said redshirt freshman linebacker Anthony Walker, who was named Big Ten Freshman of the Week, made 10 mental errors against the Nittany Lions despite having a statistically prolific day that included an interception returned for a touchdown. Fitzgerald was also critical of sophomore holder Christian Salem, who he said “didn’t go out for an extra point.” Salem also kept the ball instead of pitching on a fake field goal attempt in the first quarter and was stopped short of the end zone. Fitzgerald reserved praise for junior receiver Miles Shuler, who took his only punt return 42 yards, easily a season-long for the team. News was mixed for the Cats with regards to injuries, particularly on defense, where NU was down three week-one starters by the end of Saturday’s game. Senior safety Ibraheim Campbell will miss Saturday’s game with a hamstring injury, but Fitzgerald said he hopes senior linebacker Collin Ellis, who is still undergoing the team’s concussion protocol, will be back. He noted Ellis will return to his starting position when he comes back, despite Walker’s heroics in his absence, but the coaches will rotate Walker in as they normally do. The best injury news for NU is that sophomore cornerback Matthew Harris will be back at practice this week. Harris was carted off the field Saturday following a head-to-head hit from Penn State quarterback Christian Hackenberg, giving a thumbs-up as he departed. Fitzgerald said Harris will not take contact in practice to start the week, but the coaching staff is “very hopeful” he will be available for Saturday’s game. VanHoose said he was scared in the aftermath of Harris’ injury. In other injury news, Fitzgerald said freshman running back Solomon Vault was hurt on his opening kickoff return but did not expand on the injury. Senior wide receiver Tony Jones returned to action Saturday after missing the Cats’ previous two games. Fitzgerald also had praise for No. 17 Wisconsin, NU’s opponent on Saturday. Junior quarterback Tanner McEvoy will start for the Badgers. McEvoy, who switched from safety before the season, had four tackles in Wisconsin’s 35-6 victory over NU last year. Fitzgerald called Wisconsin’s blockers “ginormous” and listed the heights and weights of the 10 players on the Badgers’ two-deep at offensive line, none of whom is shorter than 6-foot-3 or lighter than 303 pounds. He also praised the work of Wisconsin running back Melvin Gordon, who has carried the ball 78 times for 612 yards and eight touchdowns on the season. He reiterated sophomore defensive end Ifeadi Odenigbo, who has three sacks and three forced fumbles this season, has to improve playing the run, saying the Badgers will look to exploit Odenigbo if he plays on running downs.